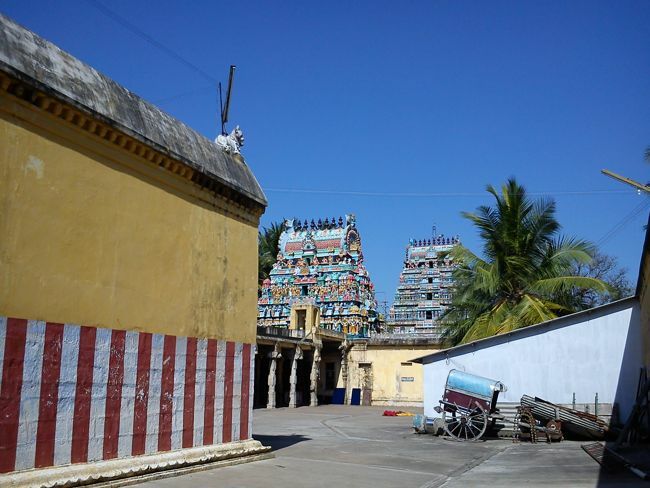 One of the unique temples on the banks of cauvery is Sri Vanjiyam Temple or Vannjinathar temple. The presiding deity here is Vanchinathar (shiva) in Swayumbu linga form. Vanchinathar means compassionate shiva. This temple is located 35 kms from Kumbakonam district in Tamil Nadu. This is one of the 6 shivastalams on the banks of cauvery. The six shivastalams are Tiruvengaadu, Tiruvaiyaaru, Chaayaavanam, Mayiladuthurai, Tiruvidaimarudur and Tiruvanchiam. 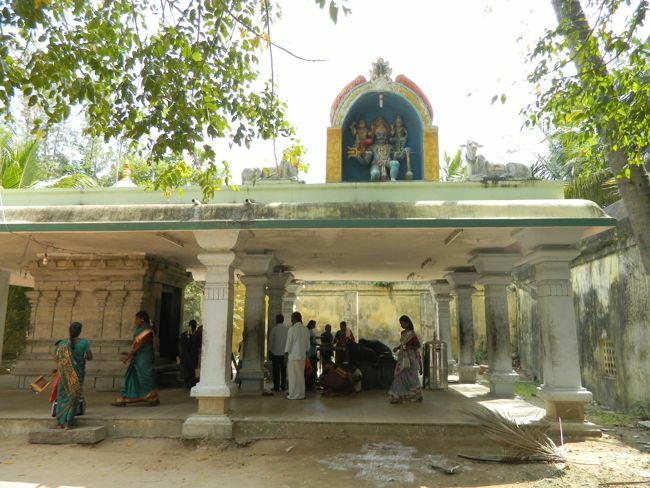 Sri Vannjiyam place is also known as ''purva janma paavam parihara stala''. Visiting this temple helps in absolving ones curse, sins committed either knowingly or unknowingly in ones past lives. This place is in par with Kasi. Visiting this place once is equivalent to visiting Kasi 100 times. The Ganga in Kasi has 1000 years and this 1000 years is known as 1 yuga, the current yuga running is Kali yuga. In kali yuga people are corrupted, more over sins committed by the ancestors are passed on to the succeeding generations which has adverse effects on them-pushing them to commit more sins! Looking at the plight of the people in Kali yuga, Ganga Devi approaches Lord shiva in Kasi for a solution. Lord Shiva advises her to leave one humsam in kasi and the remaining 999 humsam (disposition) at this place. The Ganga here is known as Gupta Ganga. In any shivites temple the first shrine to be visited is Lord Ganesha, however here it is Yama Dharmaraja. Yama is the lord of death who decides hell and heaven according to ones good and bad deeds. People fear him. Yama was very worried that he might have accumulated a lot of sins because of his nature of work. In order to find a solution and liberation from all his sins, he visits more than 150 Shiva Stalams. However, he is not granted Moksham. While he was meditating at Thiruvayur- he receives a divine message that he will be liberated from his sins at Sri Vanjiyam Shetram. He sat for penance and meditated for years. Finally, on one fine day in Masi-Bharani (Masi is a tamil month which comes in mid-February to Mid March, and bharani is one of the 27 stars), Lord Shiva shows up. Impressed by Yama's bhakthi, Lord shiva grants his wish. Yama's wish was that people should not fear him, and the devotees should first visit his shrine instead of usual lord Ganesha's shrine. DharmaRaja at his shrine is in the form of lord Shiva, next to him is a Nandhi(ox) is Shiva's vahanam, next to Nandhi is Chitra Gupta. Chitra Gupta is the assistant to Yama and also official ledger keeper, he writes down every ones good and bad deeds and reads it out during ones judgement day! Yama was very pleased by lord Shiva, and offers to be lord Shiva and Parvathi's vahanam (vehicle). The presiding deity is swayumbu Shiva linga. Some 2600 years before the linga was facing west, even the temple was facing west. During that time a major earth quake destroyed all the temples in the region, however this temple is not destroyed. Saints and sages were puzzled as how this temple was saved. They soon realize that during the earth rotation, shiva linga was turned to east along with the earth; hence saving from the earth quake. As an evidence you will find lord shiva and nandhi facing at one particular direction; normally shiva and nandhi face each other. This isn't a myth, even today people can find the evidence. Arathi is shown both sides of lord shiva linga. This place is also known to cure the rarest of rare disease. There is another interesting story as why this place is known as Sri Vanjiyam. ''Sri'' means Laxhmi who is the goddess of wealth and also the wife of Maha Vishnu. During one conversation a small misunderstanding arises between Mahalaxshmi and vishnu. Maha Vishnu angers Maha MahaLaxhmi and Mahalaxshmi comes to this place. MahaLaxmi reaches out to Lord shiva with her problem. Lord shiva helps in bringing them together hence this place is also known as Sri Vanjiyam. The goddess here is known as Mangalambikai. She is worshiped as Durga in the morning, as Mahalaxshmi in the evening and after 6 pm she is worshipped as Saraswathi (goddess of knowledge). There are separate shrine for mahalaxmi and for Mahishasuramardhini(Durga). Worshipping Her with 108 lotus flowers during Rahu kalam is considered special. The swayumbu lingam is worshiped with sandalwood leaves instead of usual vilvam (wood apple tree leaves!). The major attraction here is that there are no navagrahas in this temple and Saneeswaran (Saturn) is housed in a separate niche. There is a separate shrine for Bhairavar. 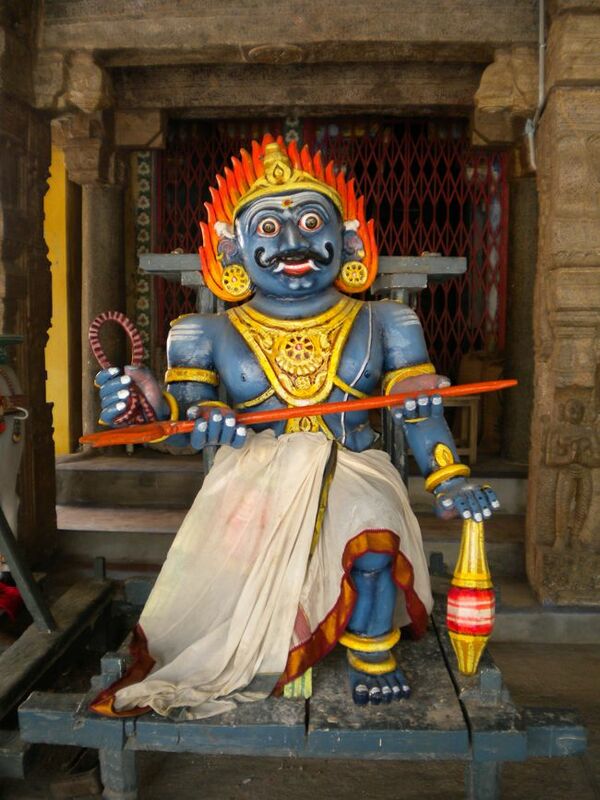 Bhairavar is in yoga posture, without his usual mount, the dog, is another rare feature of this temple. Next to the shrine of Bhairavar is the shrine for Rahu-kethu, both carved out in one composite sculpture which is another unique feature of this temple. Milk poured over this Rahu-Kethu sculpture turns blue. Performing prayers and worship at this shrine are said to bless devotees with marriage and progeny and cure nervous disorders. 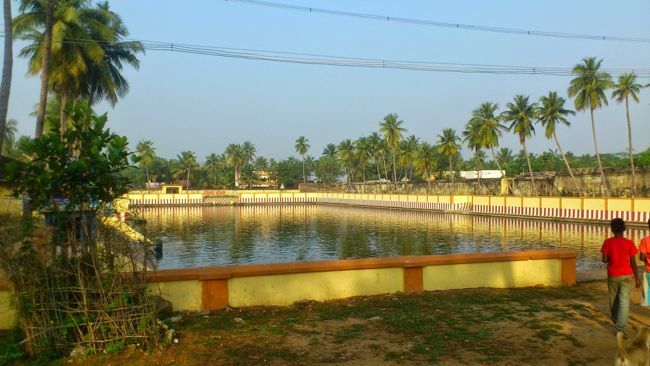 The 3 sacred tanks at Tiruvanchiam temple - Lakshmi Theeratham, Naga Theeratham and Chakra Theeratham - were created by MahaLakshmi, Adiseshan and Chakrathazhwar. 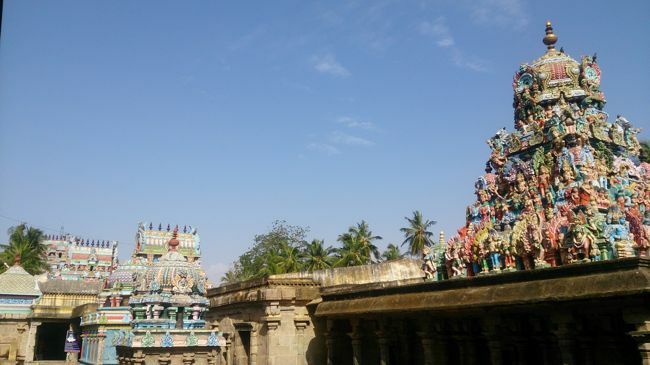 A holy dip in Lakshmi Theeratham is said to reunite a person with his estranged family. A holy dip in Naga Theeratham is said to liberate one of all Naga Doshas. It is said that by taking a holy dip in Chakra Theeratham, one is absolved of Brahmahatti dosham. Srivanchiyam Temple located in Nannilam Taluk at Thiruvarur District, TamilNadu State, India. Srivanchiyam is 16kms South of Tiruvarur. One can get down at Manakkal on the Tiruvarur- Nachiyar Koil highway. From Manakkal, auto facilities are available. From: Kumbakonam (25 km) – 1 km south of Achuthamangalam at Nannilam, Nagapattinam route. Phone: 04366 291305 ; 94424 03926 ; 93606 02973.